The construction industry has long been seen as a laggard in terms of stepping up productivity, but the Government's push to restructure the economy has forced contractors big and small to redouble their efforts to cope. Some progress has been made as companies mechanise and use prefabricated building components, but improvements have been uneven. Industry players say the bigger boys are getting by, but some smaller companies are folding under the pressure caused by foreign worker restrictions and the like. The labour-intensive industry is a key economic pillar, contributing 4.2 per cent to Singapore's total economy last year, said CIMB economist Song Seng Wun. According to the Building and Construction Authority, there are about 9,000 contractors registered with it. But productivity gains have been hard to achieve, figures from the Singapore Department of Statistics showed. Productivity was a negative 3.4 per cent in the third quarter of last year. This was worse than the negative 2.4 per cent recorded in the third quarter of 2012. The construction industry's perennial problems stem from a reliance on foreign workers, while locals shy away from the less-than-glamorous work involved. Among other issues, rising material costs and shorter construction periods have placed pressures on these builders. To encourage construction companies to innovate and reduce the number of foreign workers, the Government raised worker levies last year - up from $400 to $450 this year. The levy is set to increase to $550 next year, and to $600 the year after. Aside from the rise in levies, contractors have had to lift salaries to keep workers. With a limited pool, skilled workers are often pounced on by rivals. Mr Sin Soon Teng, chief executive of Catalist-listed building company Sysma Holdings, said he has increased his workers' salaries by 10 per cent every year. The company has 180 workers. He said levies constitute a big part of operating costs. For a $10 million project, about $2 million goes to labour cost, out of which $700,000 accounts for levies, estimated Mr Sin. "We have already mechanised whatever we can; everything that we can use, we have used," said the 69-year old, who has been in the industry for 50 years. However, even as the problems persist, some companies are attempting to adapt. Some of them have invested large sums of money in training workers and buying new machinery to reduce the need for more labour. However, these machines do not come cheap, at $30,000 to $50,000 for a mini excavator, for instance, and up to $300,000 for a system to construct building structures. It is the smaller companies, such as subcontractors that provide supporting building services, which say they do not enjoy economies of scale to justify investments in innovation. Mr Goh Poh Leong, managing director of subcontracting company Aik Lee Kim, said bigger firms can afford to do so because of the big contracts they take on. "It is more worth it for them. For firms like mine that do contracts worth less than $1 million in total a year, it is just not feasible to invest so much money," he said in Mandarin. Mr Lau Kim What, director of SCM Builders, a company that specialises in erecting hoists, added that smaller players have been forced by a tough labour situation to take on fewer jobs. "Five years ago, I could take on about $2 million to $3 million worth of jobs. Now, I take $1 million at most," he said. Delays are also an inevitable result of insufficient manpower, said Mr Sin. "Projects that took 14 months to complete one to two years ago now take 16 months." But CIMB's Mr Song believes the sizeable amount of construction contracts to be won - judging by the $25 billion to $35 billion worth of contracts won over the past seven years - should cushion any slowdown in the sector. One thing is certain though - companies have had to be even more careful in their planning and precise in their execution to prevent any wastage of precious resources, said Mr Mohamed Abdul Akbar, the construction industry's representative on the National Productivity and Continuing Education Council. To cope, Mr Akbar said one strategy is for struggling companies to focus on certain tasks instead of being generalists, as with specialisation comes increased productivity. But he stressed that there are limits. "Just like in medicine where you have specialists, you also need a general practitioner." Smaller companies could start by tapping on available assistance, such as the Construction Productivity and Capability Fund or the Productivity and Innovation Credit scheme, he said. 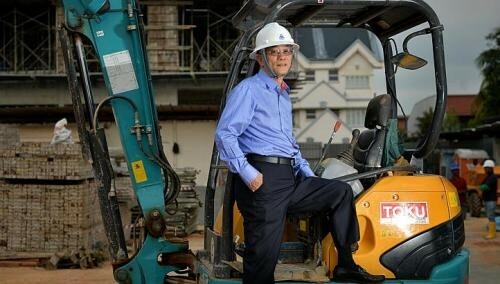 But for Mr Goh, restructuring pains have led him to switch from the business of paving roads to managing and maintaining golf courses. "Specialising is good as it means you get better at the job, but it also means you can't take on other jobs," he said.